EDMONTON — The Edmonton Eskimos have lost five of their past six games and sit in last place in the CFL's West Division heading into a critical contest against the Ottawa Redblacks on Saturday. Somehow, the 2018 Grey Cup hosts have to jump-start an offence that's come off the rails and hit the ditch. You can watch all the action starting at 5pm ET/2pm PT on TSN 1/4/5 or streaming on TSN.ca, the TSN App and TSN Direct. 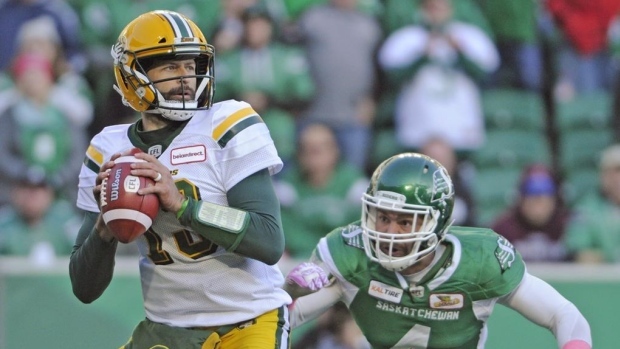 The Eskimos (7-8) haven't scored a touchdown in nine quarters and counting. They haven't scored a single point in the fourth quarter of their last four games. And quarterback Mike Reilly has been running for his life behind an offensive line that's given up nine sacks the last two games. What's more, Reilly could be less than 100 per cent for the game. Reilly wasn't on the field for Friday's walk-through because he has the flu, although he is expected to start. "He just had the flu," said coach Jason Maas, who had backup Kevin Glenn taking snaps with the first-team offence. "He just wanted to stay home so he doesn't affect everybody else. He'll be ready (Saturday). "Our walk-through was great. Kevin took charge of that and he looked good. Our guys looked ready to play. We still have 24 hours to lock it down, but right now I think we feel pretty confident that they know what to do." Edmonton hasn't scored a touchdown since Duke Williams hauled in a 23-yard pass from Reilly in the third quarter of a 28-15 loss to the East Division-leading Redblacks (8-6) in Ottawa on Sept. 22. The fourth-quarter scoring drought dates back to a 23-20 loss to the Calgary Stampeders on Sept. 3 when the Eskimos managed three points on a 43-yard field goal by Sean Whyte. "The mistakes that we make in the red zone, that's it," said running back C.J. Gable. "We get down there. We're just not executing our plays when we get down there. "It's like a fumble or an interception. We're hurting ourselves. Nobody else is really hurting us." In Monday's 19-12 loss to the Saskatchewan Roughriders at Mosaic Stadium, Reilly was sacked a total of five times and tossed three interceptions, including the winning points on a 49-yard pick-six by Willie Jefferson with 2:16 to play. After allowing just four sacks in the first six games (four wins), the Eskimos' offensive line has given up 31 sacks in nine games since. Their total of 35 is second only to Montreal and is six more than the 29 they allowed all last season. "Right now, everyone has to play better and work that little bit harder," said Edmonton's Matt O'Donnell, who is moving back to right guard Saturday after playing left tackle. "Every inch counts right now, whether it's a mis-step or miscommunication. "We hold ourselves to a high standard. If we're not getting the job done, it's not so much everyone else looking at us, it's our own group looking at ourselves. It's like, 'guys, we need to pick this up, we need to get this right.' Otherwise, we'll be sitting at home." With three games remaining — against Ottawa, at B.C. (7-7) on Oct. 19 and home to Winnipeg (8-7) on Nov. 3 — the Eskimos have left themselves no margin for error. "We've looked at everything," Maas said. "I think the biggest concern for us is the minus-12 in turnover ratio for the last three games. When you look at that, how do you curtail that? You concentrate on the details. You focus on the little things. "You make everybody understand how important every route concept is depth-wise, split-wise, what our blocking schemes are, how important it is for everyone to do their job so that when (Reilly) drops back he sees a bigger picture, a better picture and can focus on the throws. "He needs to be more accurate at times. We've worked on his footwork, we've worked on some things ... we've played better than what I think our offensive production has been, but at the same time we've got to be better." LAST TIME: The Redblacks handed the Eskimos their fourth consecutive road loss in a 28-15 decision at TD Place on Sept. 22. Rookie kicker Lewis Ward was the difference with seven field goals. That defeat started Edmonton's current three-game losing streak. Ward has been successful on 40 straight field goals, a CFL record. DOWN THE STRETCH: While the Redblacks haven't struggled to the extent the Eskimos have in recent weeks, they're coming off a 40-32 overtime loss to Winnipeg in which they took 12 penalties for 174 yards and are 2-3 over their last five games. AERIAL ASSAULT: Despite struggling in recent weeks, Edmonton's Mike Reilly continues to lead the league in passing yards with 4,605 . Ottawa's Trevor Harris sits third at 4,217. THE RECEIVING END: Edmonton's Duke Williams leads the league in receiving yards with 1,415. Ottawa's Brad Sinopoli leads in receptions with 95 and is second in yards with 1,157. STICKING AROUND: The Eskimos signed defensive lineman Almondo Sewell to an extension through the 2020 season on Friday. First signed by the Eskmios 2011, Sewell has been a CFL all-star the past five seasons.